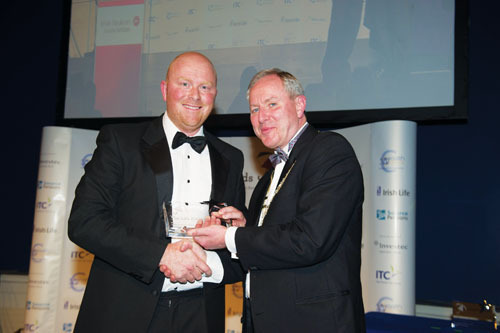 Local Westmeath broker Damien Kelly of Planalife scooped the prestigious Best Leinster Broker Award at the inaugural Irish Brokers Association Life Pensions & Investments Awards. The awards were the brainchild of the Irish Brokers Association - the representative body for brokers throughout the country - who wanted to ensure that those at the forefront of the financial services industry were recognised for their expertise and critical advice they give to their clients. The 380 people who attended the event last week, which was held at the Mansion House in Dublin, watched as eight financial service professionals scooped awards in a variety of categories, while Owen Morton from Moneywise received the IBA LPI Broker award for Lifetime Achievement. The event was hosted by the Irish Brokers Association in conjunction with the awards sponsors Independent Trustee Company, Investec, Irish Life, Source Pensions, and Wealth Options.